The announcement comes in an effort to market its versatility of same-day service products utilizing mobile technology, expand its current customer base and increase online sales via mobile devices. A-1 Express, a recognized leader in same-day delivery, messenger and distribution services, announces its 2-hour same-day delivery available on its mobile app. The announcement comes in an effort to market its versatility of same-day service products utilizing mobile technology, expand its current customer base and increase online sales via mobile devices. A-1 Express pursues to be the best choice for superior same-day delivery courier solutions throughout the US. The 2-hour same-day delivery service option, Express service, is available via the courier's mobile app nationwide. The mobile app will appear when visiting the courier's website from any mobile device. Visitors have the option for the mobile application view, yet they can click "view our desktop site" and be reverted back to the desktop view preference. Account holders can log in on the mobile app and use their account for courier orders. 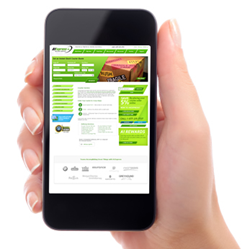 From the mobile app, customer can ship their package, obtain an online quick quote, and track their package. The Boston courier has made the mobile app to be simple and user-friendly in order to place the 2-hour same-day delivery quickly. It is beneficial for customers with last-minute service needs on-the-go. A-1 Express will perform the service within an approximate 2-hour window time frame. The courier will perform the pick up and delivery within that window, from the time the customer has stated the package is ready. Due to customer variations of their courier services, there are no specific pick up or delivery times available within the Express service option. Customers can place their order request for a 2-hour same-day delivery service via phone or online. For any mobile app assistance or service option adjustments, A-1 Express is available 24/7 to assist its' customers with any of their same-day delivery needs. A-1 Express is a recognized leading same-day courier for same-day delivery, transportation and distribution services. A-1 Express manages a growing list of 1,500 clients nationwide and takes great pride in providing the highest level of courier services. From individuals to Fortune 500 Companies, A-1 Express has the logistical expertise to create courier solutions and on-time deliveries. A-1 Express pursues to utilize the best in modern, courier technology to be the premier courier service provider nationwide.